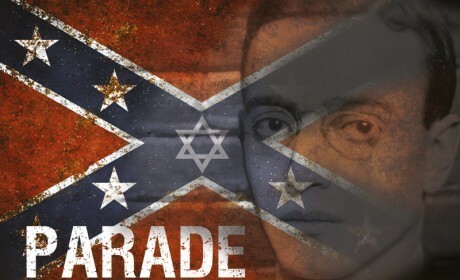 Parade – by Forest Musical Theatre Company at the Kenneth Moore Theatre from 26th -28th March. So once again I turn my attention to the amateur theatre circuit and I headed on down to Illford to see this production. I have to confess that with this production I went with 2 caps on, one as a massive fan of the musical and two knowing that Bromley Players, my ‘home society’ were putting this show on next year! I have also never seen a show from this society before so I went not having a clue what to expect. For those that don’t know Parade by Jason Robert Brown I urge you to give it a listen. It is set in 1913 and based on the true story of Leo Frank, a Brooklyn raised Jew living in Georgia who is accused of murder of a 13 year old girl. The show follows the trial and the aftermath. This show is not an easy show to put on for an amateur group – it requires a multi ethnic cast (a minimum of 2 black men and 2 black women) as well as at least 12 men with a good singing voice to cast the principal roles alone 9those of you involved in amateur theatre will know that men can be somewhat of a rarity). That being said Forest Musical Theatre Company did an outstanding job with this production with strong principals and ensemble. The central character to the show is Leo Frank. He was played by Nick Ford. He was a strong actor which, with a part like this, has to be the primary consideration. His voice was tuneful although I would have liked a little more punch in his voice in some of the bigger numbers such as ‘All The Wasted Time.’ His wife, Lucelle Frank, played by Alison Buckingham was also acted very naturally and beleivably. Unfortunately I would make the same comments regarding a bit more power needed behind her voice however hers and Leo’s voice blended well together and they seemed very comfortable with each other on stage. They portrayed the developing relationship between the 2 characters in a very believable manner. One of the standout performances for me had to be from Daniel Haswell who played Jim Conley. His voice suited the part down to a T and his soulful sound contrasted perfectly with the white characters and literally sent shivers up my spine. He was constantly in character and so watchable on stage. His main number, ‘That’s What He Said’ was the highlight of the show for me. I understand that he has played the part before and is going onto play it again in a few weeks time, and with a performance like that I can see why he is in demand. Other mentions must also go to Jessica Daugirda who played the role of young Mary Phagan. Her credentials seem impressive (West End productions of Billy Elliott, Matilda, Les Miserables) and with that you go with high hopes and she did not disappoint. It must be a challenge to find a girl looking the correct age for this part that also has the voice to sing the part and the maturity to act the part but Jessica made it look easy. I must also single out Jonathan Saunders who played Frankie Epps and the Young Soldier. He has the job of opening the show and after the first bar of his singing I knew that his part was in a safe pair of hands and immediately felt more at ease about the quality of what else was to come. He sang, acted and moved brilliantly. Governor Slaton, played by Andy Nicol came into his own in his number ‘Pretty Music,’ showing he could not only sing but dance as well and his portrayal of the character was authentic. As I’m sure you can tell I was impressed with the quality of the principles. There were a few niggles in so far as Judge Roan played by Paul Willes could have had a bit more gravitas and in reverse Leo’s lawyer Luther Z Rosser, played by Owen Smith could have had a stronger character, possibly slightly drippier. The ensemble all moved with conviction and their acting in the funeral scene was particularly convincing. On occasion I would have liked more sound out of them. The show was well directed as a whole although the televisions at the side showing slides during the show setting the side were superfluous and at times distracting as on occasions I could not make out what they were supposed to be. I was also a little disappointed by the ending. I do not want to give too much away for those that have not seen the show but suffice to say I would have liked to have seen something more dramatic than a simple black out. The show however had great pace, a nice use of levels and smooth transition from scenes to scenes making good use of the space available on stage and lighting to ensure the numerous scenes could transition smoothly into another without having to wait for scene changes. With a show such as this with few moments of light relief it can sometimes drag but this wasn’t the case here and a friend that I attended with stated that she didn’t want the interval to happen! As a fan of the show I felt they did the show more than justice and is one of the better amateur productions I have seen for a while. If my home society put on a production of Parade of an equal standard it would be a show that I would proud to be part of and I’m sure all those in Forest Musical Theatre Company are as well. I look forward to seeing some of their future shows and off the back of this is a society that I would recommend people check out their productions.